The Cressi Tecnica 3.5 mm Spearfishing Wet Suit Long John is one piece of a 2-piece suit design that is made using special Computer Printing Technology for a unique Camouflage Pattern that renders the Diver Nearly Invisible, even at a short distance making this one great suit for the hunt. The Full Suit is comprised of a Hooded Jacket and a High Top Pants. This product is the High Top Pants, or Long John, only. All Suit Seams are Glued and Sewn for Strength and Durability. How to wear a two piece spearfishing wetsuit. The High Top Pants have Durable Knee Pads. The Legs of the Suit are ergonomically Pre-Formed to Fit the Natural Position of your body for added Comfort and Fit. The suits inside is lined with Black Metallite, a material that guarantees great wear and tear and makes it easy to put the suit on and take it off. A fantastic design and an amazing wetsuit! This is the Bottom only of the full two piece suit design. Available in sizes 1 to 7. 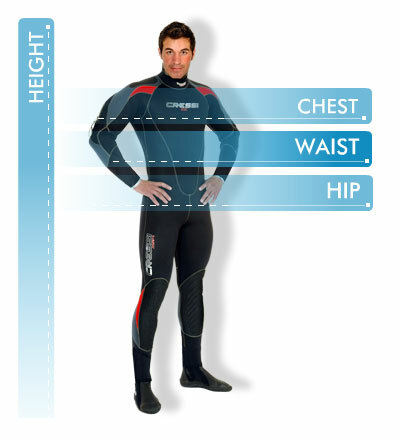 We now have a set of Cressi non open cell neoprene suits with the same sizing you can try on in store. Then we can order in your open cell neoprene suit and you can be confident that it will fit.